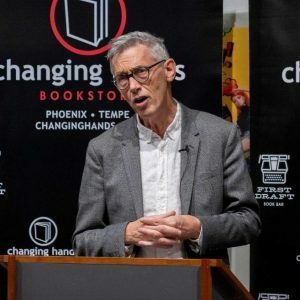 The public lecture Oxford Professor Jonathan Bate delivered Tuesday night at Changing Hands Bookstore in Phoenix, cheekily titled "The End of the World As We Know It," made a connection between sustainability and the humanities. Bate’s talk was the second of three in his “How the Humanities Can Save the Planet” lecture series, taking place during his spring 2019 residency at Arizona State University’s Julie Ann Wrigley Global Institute of Sustainability and presented with support from the Department of English and the College of Liberal Arts and Sciences. A prominent biographer, broadcaster and eco-critic who was knighted in 2015 for his services to literary scholarship and higher education, Bate is also co-teaching an eco-literature course during his residency with ASU English Professor Mark Lussier, who introduced him at Tuesday’s event. The lecture contained just as many pop culture nods — R.E.M.’s similarly titled late-1980s alternative hit made an appearance — as it did renowned literary and ancient mythological references (the Epic of Gilgamesh and Deucalion, son of Prometheus, turned out for the event as well). The sheer range of apocalyptic narratives Bate was able to reference would seem to make a good case for his assertion that, at least in Western storytelling traditions, humans are obsessed with endings. He began with a brief overview of the topics addressed in each of the three lectures: The first, "Paradise Lost," looked back at the shared cross-cultural sense that there once was a better time, a Garden of Eden scenario, when humans were at one with nature; Tuesday’s lecture looked forward, at the shared cross-cultural preoccupation with doomsday narratives; and the third, "Living Sustainably," which takes place Wednesday, Feb. 20, will discuss some of the ways humanities might help to change the future. Over the course of the next hour, Bate presented several throughout time and across cultures, all of them apocalyptic in nature, and laid out some thoughtful takeaways for each. Read the full article on ASU Now.